We all have our gifts, talents & passions. Now, with the last blue moon for the next 5 years, it’s time to be utilising yours! Please don’t use the excuse you’re not talented/gifted in something. We ALL are! The trick, with working out what you’re gifted is, it to understand what makes you happy when you try it! My eldest is quite the artist & thinker, the middle one is very much more the Duracell bunny, try everything & bounce off the walls! The daughter hasn’t figured that out yet, but she’s got bags of time to figure that out. I learned quite early on I love creating, drawing, thinking up new ways to do something. I was very much the Page of Pentacles as I was growing up, now I’m a mix of the Queen of Pentacles & the Page of Cups, mixed in with some of the other courts. The trick though is to start using your gifts for your own ends! I love creating bags or cards as additional gifts for others; I spend as much time on their card as I do their gift! Sometimes, I have the time to make both, sometimes only just one of them. Being gifted doesn’t mean you get to ignore the other aspects of you, it just means you play to your strengths & encourage others around you to do the same. That embodies teamwork & can test you & others in ways you never thought possible! If you’re like me, a lady above a certain age you probably know your own skills, well, most of them! Listen to this whilst you read on. I’ve designed this Gifted Spread to work out what your skills might be. You can use it yourself, feel free! 1/ What do I offer? 2/ What do I need? 3/ What are my best gifts? 1/ What do I offer? The Page of Cups; the typical Pisces card I call it; often learning about our emotional selves & not quite knowing what the heck to do about it all, but it’ll come to us eventually! This card is all about learning; emotional boundaries, emotional abilities, emotional learning & learning who YOU are, not what others tell you that you are. It’s not an easy thing, it is a constant adjustment & working things out. 2/ What do I need? The Emperor came out for this one for me. The trick here is, I need some structure & plans; the hubby is good for that; he contains me whilst I encourage him to just let it flow & go with it. Sometimes, I feel we need a mixture of both aspects to get things done. In the adverse though, I can be a bit of a control freak if the mood strikes me. I can micromanage things, or attempt to. Again, my husband & life partner is quite good at telling me to pack it in when I get like that. 3/ What are my best gifts? 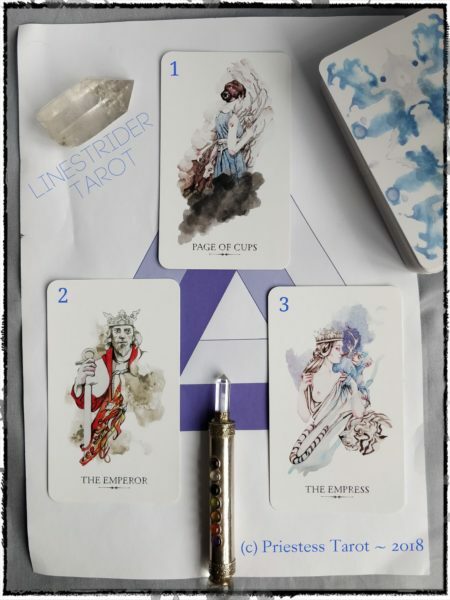 The Empress comes out & the first thing that strikes me is the nurturing aspect of The Empress. I’m the one that’ll tell the kids to “just try it, see how it goes?” Most of the time, they’re grateful that they tried. Sometimes, they’re gutted that things didn’t go their way & that’s life! I’d rather they tried when they were kids & able to just shrug it off than as adults & expect everything to go their way. The Empress is also good at having ideas, of creating something, of being your muse; I’m happy to do that for others, to give them ideas, a goal to aim for. What they do with it or because if it, is totally down to the individual concerned and their dreams. So the cards for me say this; my gifts are the emotional learning for others or the start of them. I’m there to start teaching them, to kick things off. I need structure & rules to help me do that, so I don’t overstep my boundaries (I can do that without too great an effort!) My best gifts are those I nurture in others as well as myself. I can nurture along the way, but ultimately, it’s up to me to help others realise the potential in themselves; that’s one of my gifts. Think about the other things are you gifted at, spend the time to think about what you think others are gifted at where you can work together. If you’d like to enlist my help & realise the potential in yourself or if you need some nurturing, you can find me right here.